The Perseid meteor shower will burst into light this August as Earth passes through the long trail left by Comet Swift-Tuttle—and this year, it's slated to put on a spectacular show. Here's how and when to see the Perseids. To learn more about the Perseids and other summer meteor showers, check out our Best Summer Meteor Showers Guide. Or, read on to learn how and when to see the Perseids, and what causes this year's outburst. Earth will pass through the path of Comet Swift-Tuttle from July 17 to Aug. 24, with the shower's peak—when Earth passes through the densest, dustiest area—occurring on Aug. 12. That means you'll see the most meteors in the shortest amount of time near that peak, but you can still catch some action from the famed meteor shower before or after that point. The meteors will seem to originate from the constellation Perseus, which appears on the horizon at about 10 p.m. local time. However, the most meteors will be visible after midnight. They can appear all over the sky, but they will always look like they're streaking away from Perseus. The full moon is on Aug. 18, so you will likely get a better glimpse of the meteors earlier in themonth, when the moonlight is not as bright and disruptive. Comet Swift-Tuttle is the largest object known to repeatedly pass by Earth; its nucleus is about 16 miles (26 kilometers) wide. It last passed nearby Earth during its orbit around the sun in 1992, and the next time will be in 2126. But it won't be forgotten in the meantime, because Earth passes through the dust and debris it leaves behind every year, creating the annual Perseid meteor shower. When you sit back to watch a meteor shower, you're actually seeing the pieces of comet debris heat up as they enter the atmosphere and burn up in a bright burst of light, streaking a vivid path across the sky as they travel at 37 miles (59 km) per second. When they're in space, the pieces of debris are called "meteoroids," but when they reach Earth's atmosphere, they're designated as "meteors." If a piece makes it all the way down to Earth without burning up, it graduates to "meteorite." Most of the meteors in the Perseids are much too small for that; they're about the size of a grain of sand. This year, the comet's path is particularly crowded, which means the meteor shower is in "outburst"—a condition that occurs when the debris clumps together because of the influence of the giant planets, Cooke said. "This Perseid outburst coming up in August—you could think of it in simplistic terms as Jupiter's gravity causing the particles to concentrate in front of Earth's path," Cooke said. "That doesn't happen with all showers, but since the Perseids have an orbit that takes them well past Jupiter, they can pass close enough to Jupiter that its gravity can mess with them." The outbursts are irregular, and scientists have only had the computational power to predict what years they'd occur since the late 1990s. 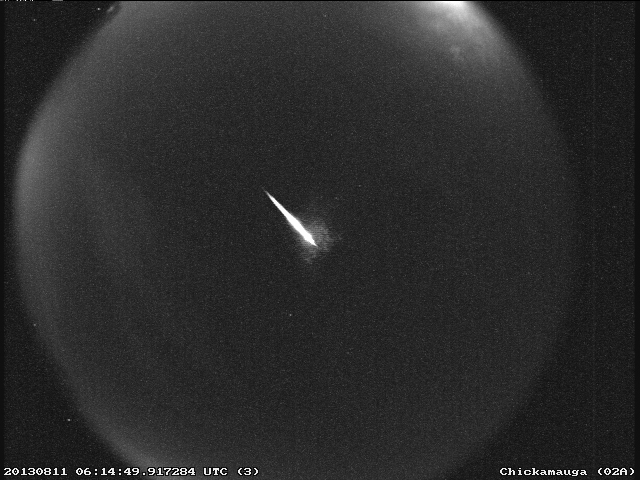 The key to seeing a meteor shower is "to take in as much sky as possible," Cooke said. Go to a dark area, in the suburbs or countryside, and prepare to sit outside for a few hours. It takes about 30 minutes for your eyes to adjust to the dark, and the longer you wait outside, the more you'll see. A rate of 150 meteors per hour, for instance, means two to three meteors per minute, including faint streaks along with bright, fireball-generating ones.